Personal narratives were selected to be published with Amazing-Kids.org in February 2016. The personal narratives were written in 8th grade language arts classes as part of the project-based learning project “The Power of Story.” Students wrote about a person or a time in their life that made a big impact on them personally. The students were given a choice to share the narrative with that person, write a reflection or submit the narrative to Amazing-Kids.org. Below is the list of students and their selected narratives. Mariemont Elementary recognized 23 students who were nominated either by peers or teachers for going above and beyond with carrying out the quarterly kindness theme (Communication and Feelings) during the month of December. 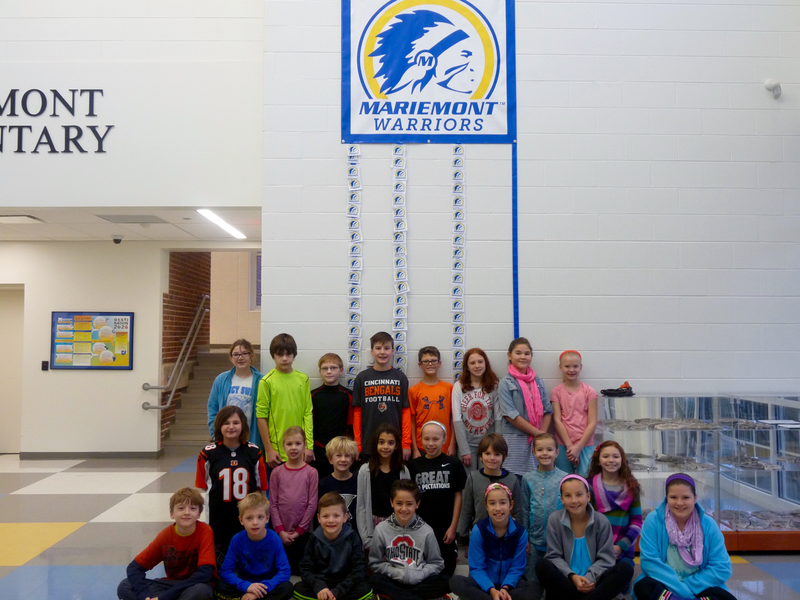 Congratulations to these December Mariemont Elementary Warriors! 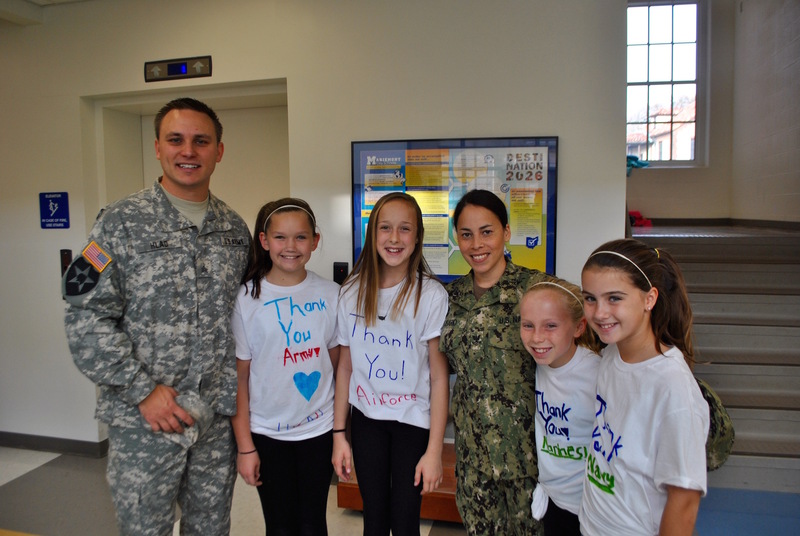 The students at Mariemont Elementary prepared a special program to honor our veterans. 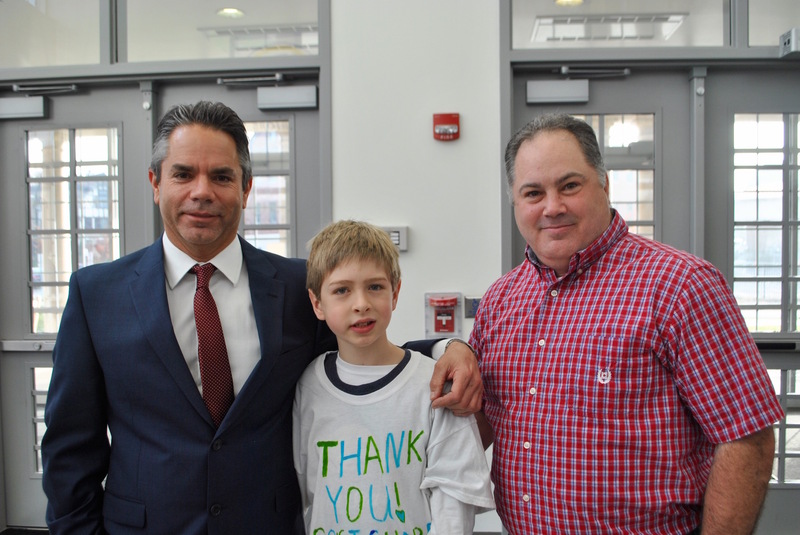 Loved ones and community members who are veterans were invited to attend the school-wide celebration. Thank you to all of our veterans! 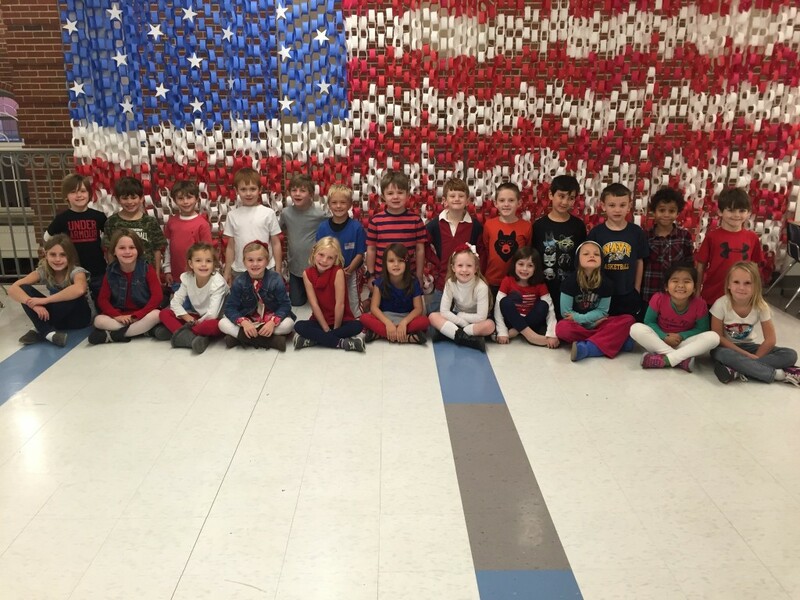 Mariemont Elementary 1st grade students sit in front of the “flag” they created. Mariemont City Schools selected a new band director to begin in the summer prior to the 2015-16 school year. 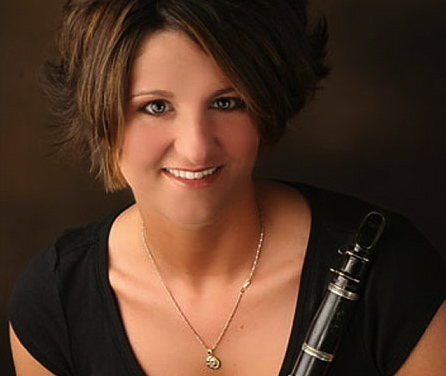 Angela Pontious has over 10 years of teaching experience, including as director of instrumental music & performing arts department chair at Highland High School in the Salt Lake City School District, Salt Lake City, Utah, where she instructed concert band, marching band, jazz band, percussion ensemble, string orchestra, chamber orchestra, beginning piano and music theory. Prior to her work at Highland High School, Angela was the director of bands at American Fork Junior High and High School (American Fork, UT) and Bull Run Middle School (Gainesville, VA). 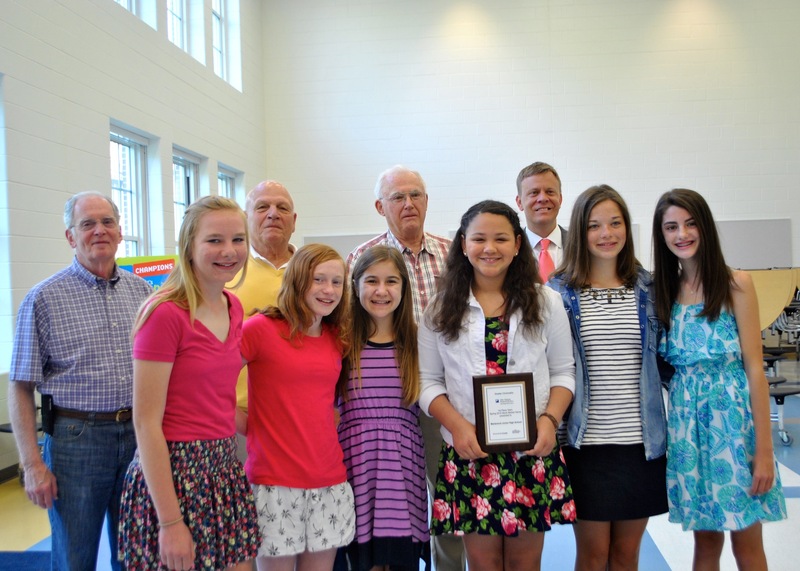 Her performing groups have participated in region and state events and have consistently earned excellent and superior ratings. Pontious earned her Bachelor of Science degree in music education from Ball State University and her Master of Arts degree in arts administration from Florida State University. She is a published author, focusing on topics such as technology in the classroom and music coalitions. She has also volunteered with the Utah Symphony and Miami University’s Performing Arts Series in Oxford, Ohio. Rick Canter, the school district’s current band director, accepted a position at Walnut Hills High School, beginning this summer. The process to select the district’s next band director included several rounds of interviews, which included staff, administrators, parents and students. The Mariemont Board of Education will officially vote on the recommendation of Angela Pontious as the district’s band director at the June board meeting. The essay winners stand with the Kiwanis members who have served our country. During a May Kiwanis Club of Mariemont meeting, the writers of the winning Memorial Day essays read their written works of art. 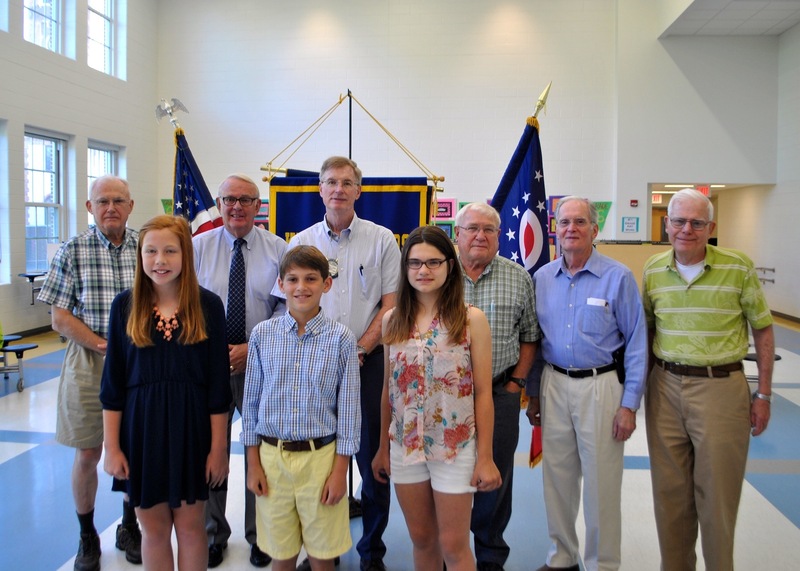 All of the winners are currently in 6th grade in the Mariemont City School District, and all of the winners will read their essays during the Memorial Day ceremony in each district community. The essay winners are Trip Fries from Terrace Park Elementary; Ally Scheeser from Mariemont Elementary, representing Mariemont; and Ellese Lowery from Mariemont Elementary, representing Fairfax. Olivia Simpson, from Mariemont Elementary, was named runner up. The essays focus on the bravery of all of those that have protected or currently protect our country, the sacrifices people have made for freedom and other patriotic anecdotes and historical facts, including the celebrations of and reflections on the life and impact of a soldier or veteran. 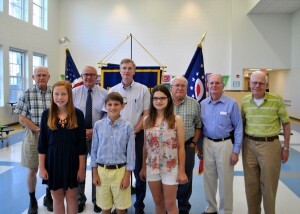 The month of May is Student Achievement Month for Kiwanis, and this week the group presented the Outstanding Community Service Award to students from Terrace Park Elementary and Mariemont Elementary. 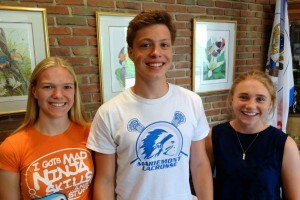 This year, the Outstanding Community Service Award was presented to Samantha Flerlage at Terrace Park Elementary and Abby Scheeser at Mariemont Elementary. Samantha is a 6th-grade student, who has accummulated 44 hours of community service this school year. She has volunteered with her church’s Sunday school program, Girls on the Run, Matthew 25: Ministries and around her school and community. 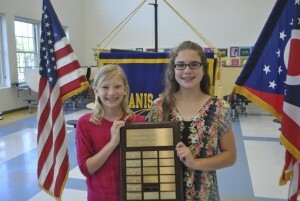 According to 6th grade teacher and Builders Club advisor, Ann Williams, “Samantha is always happy and optimistic. Samantha once told me that she likes to give back what the community has given to her.” Samantha raised over $800 for Children’s HopeChest, which will help feed orphans in Ethopia. “I am so thankful that the community cared so much and was so generous,” said Samantha. 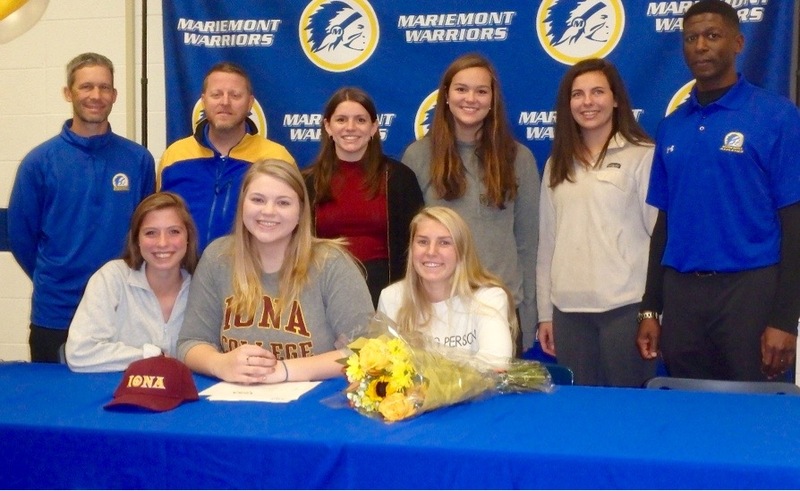 Congratulations to these two students and role models for us all! We would like to extend our thanks to Don Guerney and Jack Smith, the Kiwanis members who help with the Builders Clubs in both of our elementary school buildings. Builders Club is dedicated to community service, and is where the students get an opportunity to get involved with leadership opportunities. The Builders Club members in both elementary schools assist in various ways around the school building and the community. 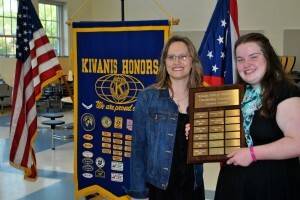 Click here for more information about our local Kiwanis chapter. “Your presence is felt, is known and is greatly appreciated. We’re grateful for the impact you’re having on our schools,” said Ericka Simmons, principal of Mariemont Elementary, about Kiwanis. The motto of our school district is to create scholars of today, leaders of tomorrow. 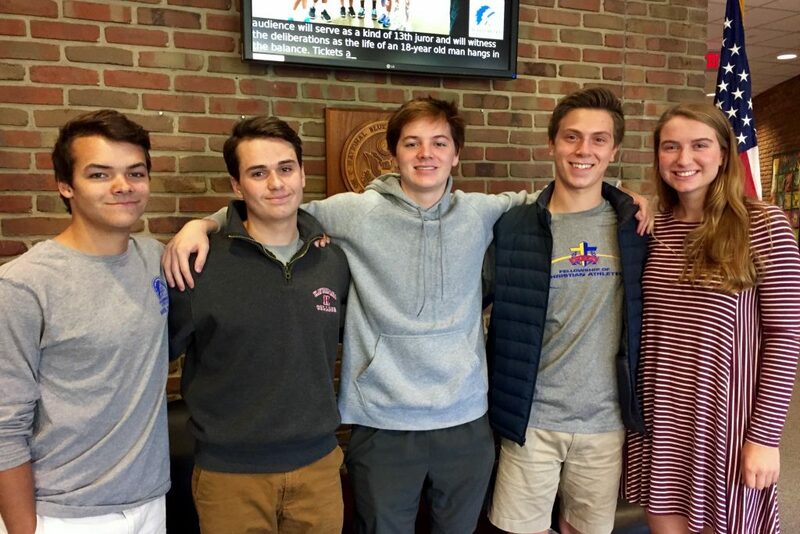 As part of that mission, Mariemont High School focuses on leadership qualities to help students understand what it takes to become a leader. Each month, one leadership quality is highlighted and teachers can nominate students who have shown this quality during the month. For the month of April, the leadership quality of the month was responsibility. Liz Geary was nominated by Mrs. Leszczuk for her work with her service dog. Congratulations to all of the students that were nominated. You are role models both in our school and in our community! This month is Student Achievement Month for Kiwanis. 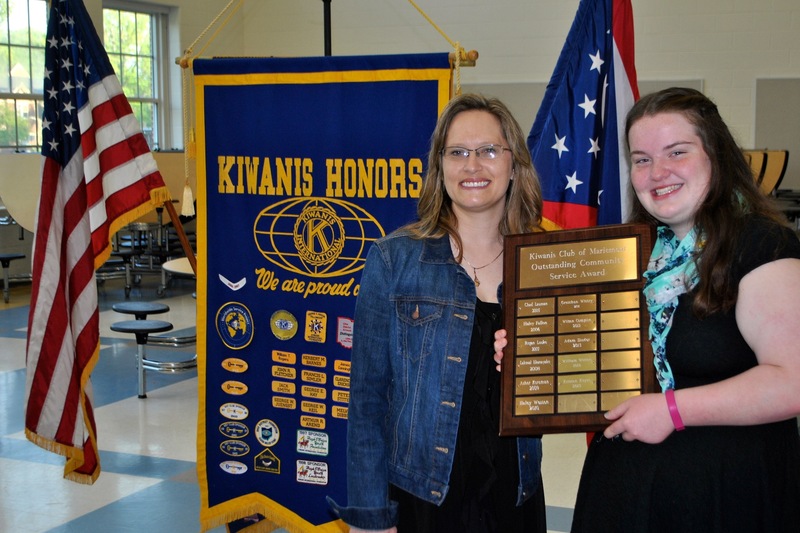 This week, the group presented the Outstanding Community Service Award to Kristen Keyes, a Mariemont Junior High School 8th grade student and recognized the Mariemont Junior High Stock Club, “Warrior Stocks,” that placed 1st in the regional competition and 3rd in state. The MJHS Builders Club has 25 active members, and in addition to the students volunteering collectively with many events and activities, they also pursued their own community service projects, through places of worship, with their families and within the Greater Cincinnati community. 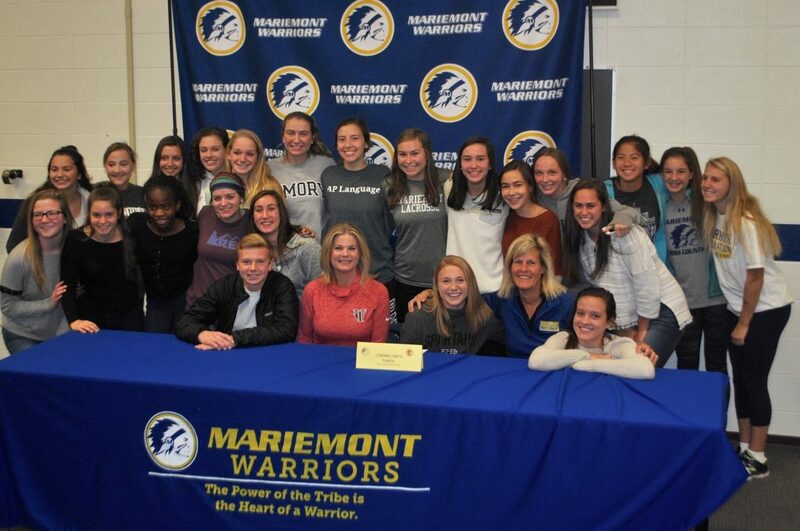 Mariemont Junior High School Principal Molly Connaugton presented an award to the “Warrior Stocks” members. 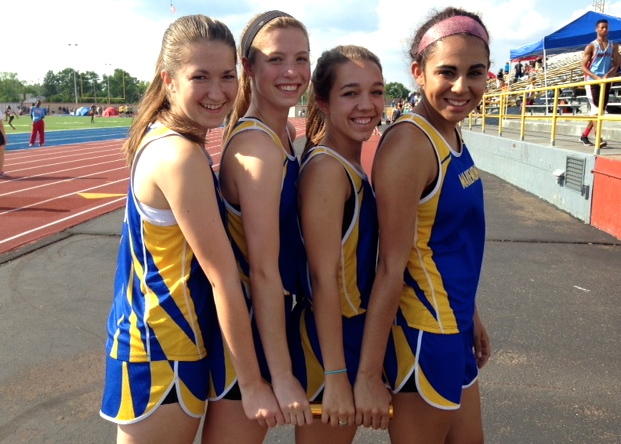 Annie Doran, Jossey Frye, Jacquelyn Kauffman, Abby Miller Melanie Weiss and Claire Wilder, lead by the Kiwanis of Mariemont Stock Market Game leader Roger Stafford, truly excelled this year.